One of Grant Morrison's most controversial and trippiest and abstract comic book titles! Follow the adventures of The Invisibles, a secret organization out to battle against physical and psychic oppression brought upon humanity by the interdemsional alien gods of the Archons of Outer Church! 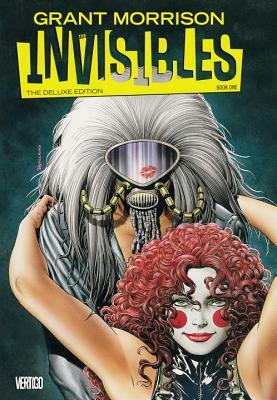 Collects THE INVISIBLES #1-12, ABSOLUTE VERTIGO #1. Grant Morrison has been working with DC Comics for more than twenty years, beginning with his legendary runs on the revolutionary titles ANIMAL MAN and DOOM PATROL. Since then he has written numerous best-sellers — including JLA, BATMAN and New X-Men — as well as the critically acclaimed creator-owned series THE INVISIBLES, SEAGUY, THE FILTH, WE3 and JOE THE BARBARIAN. Morrison has also expanded the borders of the DC Universe in the award-winning pages of SEVEN SOLDIERS, ALL-STAR SUPERMAN, FINAL CRISIS and BATMAN, INC., and he is currently reinventing the Man of Steel in the all-new ACTION COMICS. In his secret identity, Morrison is a “counterculture” spokesperson, a musician, an award-winning playwright and a chaos magician. He is also the author of the New York Times best-seller Supergods, a groundbreaking psycho-historic mapping of the superhero as a cultural organism. He divides his time between his homes in Los Angeles and Scotland.